Founded in 1994, Microgaming is one of the oldest and most recognised suppliers of online casino software. In addition to proving top quality games, what separates Microgaming from the rest is its proven track record. They are among the founding members of the Interactive Gaming Council and have also paid out some of the biggest online slot jackpots in the history of the industry. The stunning quality of their software was highlighted in 2010 when they won two awards, the Casinomeister’s Best Software Supplier Award and the Best Casino iGaming Software at the 2010 iGB Affiliate Awards. We also often run various casino promos with this game. Step back in time to the Age of Discovery, a pivotal time in our cultural history where great European nations set sail across the oceans to discover uncharted waters and distant lands. 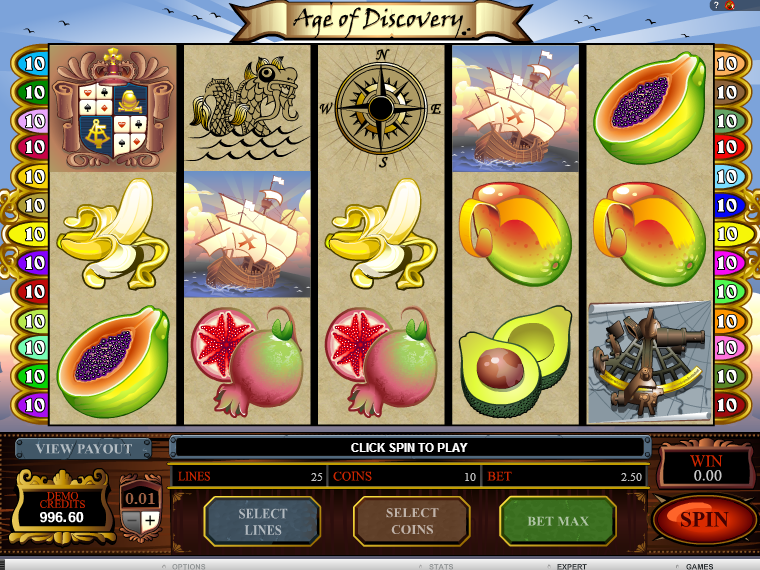 You can go on your own voyage with Age of Discover online slot, and set sail from 1p up to a maximum of £250, which is much cheaper than what it would have cost back in the 15th century. This stunning online slot comes with 5 reels and you will need to navigate around 25 paylines, which are fully adjustable. The reels are decorated with symbols that belong to that age and those who were brave enough to travel. These explorers would bring back exotic items such as bananas, avocados, mangos, and star fruit. You also have a sextant symbol, a coat of arms and the explorers ship on the reels. The gold coin is your Wild symbol, and it will substitute for all other symbols bar the Sea Monster Scatter and Compass Scatter symbols helping you to create those winning combinations. If you land 3, 4 or 5 Sea Monster Scatter symbols you will receive a multiplier of 5x, 20x or 80x times your total bet! This is why it might be handy to activate all 25 paylines so you can take advantage of this bonus. Join and play today! If you land 3 or more Compass Scatter symbols anywhere on the reels, you will then activate the side bonus game. In this feature you will be shown a map of islands covered in ‘X’ treasure marks. To navigate your way through the islands to find that hidden treasure, all you have to do is select the treasure spots and collect the random cash prizes! However, if you uncover the Skull and Cross Bones symbol head back to the ship, because the bonus is over. Spin the wheel today and pay by phone slots. This online slot game will appeal to anyone who enjoys a good adventure theme. The betting range will also appeal to low limit players and high rollers. To get the most out of this online slot you might want to activate all 25 paylines, this way you can take advantage of all those generous multipliers from matching symbols. Either way, you will have lots of fun and be fully entertained as you voyage your way through high seas and discover new lands, treasures and riches without ever having to leave your own home. See more easy slots game here!